Many horse owners love the company of animals. Horses are very intelligent animals thus it is no surprise that most horse owners are dog lovers too. However, not all dogs are suitable to run along with the horses. As your horse gallops, it will be a wonderful sight to have your dogs running along with them. These breeds of dogs suitable for horses is not exhaustive. Feel free to add in more if you deem fit. Please be mindful that, for your dog to get along with the horses (regardless of the breed), there must be some obedience training done beforehand. Placing an untrained dog beside a horse is asking for trouble. 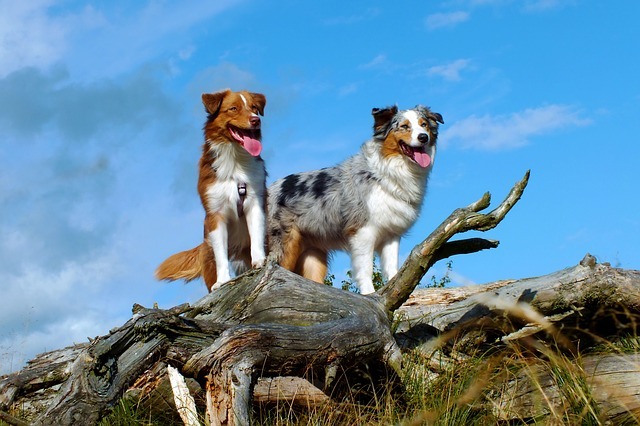 The Australian Shepherd has endless amount of energy and vitality. This breed originated from the United States and not Australia. It is common for horsemen to have a few Australian Shepherds running with them as their horses gallop. The Australian Shepherd is regarded as a huge sized, but not giant sized dog. They can weight between 40 to 65 pounds and up to 1 foot 11 inches tall. They are obedient, intelligent and very easy to train. There are different variation in the colour of their coat and eyes. They can pick up basic obedience commands relatively easily and has abundant stamina to last through a day of running with the horses. With the Australian Shepherd, you have to prepare for common health issues like hip dysplasia, elbow dysplasia and epilepsy. However, like any other dog breed, if given proper exercise and healthy diet, your Australian Shepherd should do well. 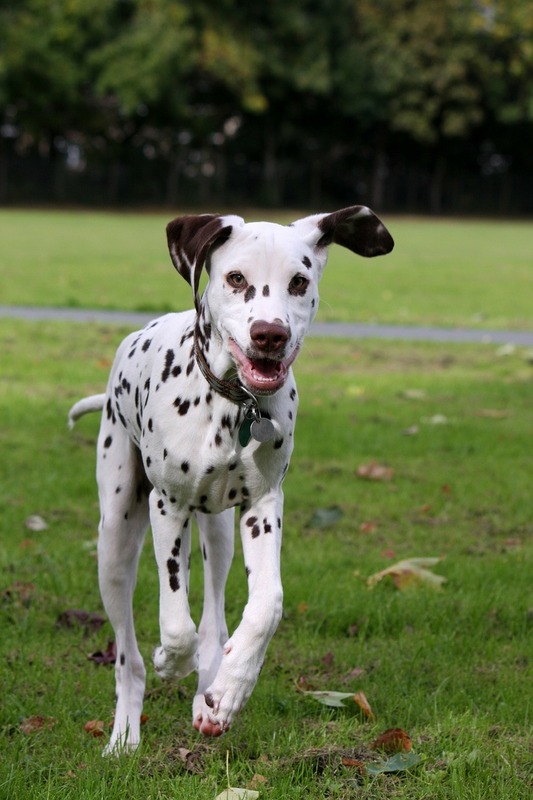 Dalmatians are well known to be active and playful. This widespread impression is due to the popular movie 101 Dalmatians. However, if left untrained, the Dalmatian can be an aggressive dog. It is documented that Dalmatians have attacked human before, though it is rare. In the United States, Dalmatians are also known as Fireman’s dogs as it was a common sight to see them running alongside carriage horses that powered the fire vehicles in times of old. Dalmatians helped to keep the horses calm by keeping away stray dogs. And that endless running is a great trait to have around horses. The Dalmatian is not a small dog. It stands tall up to 2 feet at the shoulder and can weigh up to 55 pounds. The typical lifespan of a dalmatian is 13 to 16 years which is long for a dog of its size. Key thing is to have an active dalmatian if you want them to mingle well with the horses. They need human interaction and will suffer if left alone at the backyard. With his natural sense of humour and alertness, the dalmatian will prove to be one of the best assets to your livestock, especially amongst the horses. There is no coincidence that two of the best dogs with horses start with “Australian”. Known to herd the cattle, they are silent warriors and guardians for the owner. As horses are sensitive animals, they need a dog who will not bark incessantly. This is where the Australian Cattle Dog outshines the rest. 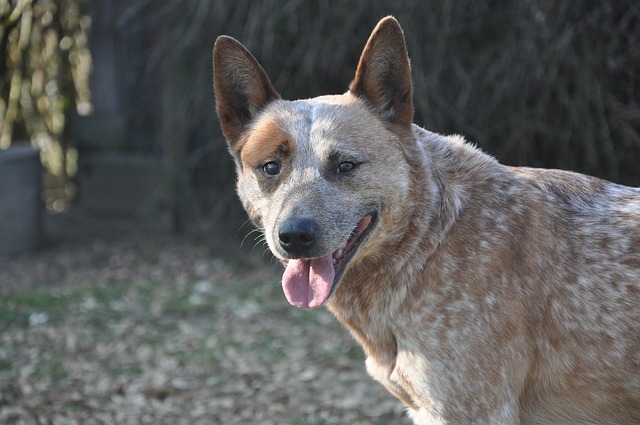 The Australian Cattle dog will score high points in agility, obedience and canine sports tests. Its in their genes to handle herds of cattle in the wide open fields. Make sure you assign specific tasks for him to do. If not, he might get restless very easily. The typical weight of an Australian Cattle dog is between 18 to 20 inches tall. Their weight is about 30 to 50 pounds. This puts the Australian Cattle dog as a stocky and muscular dog, instead of a lanky dog. And being stocky, it can withstand the tough duties of herding cattle. If you wish to associate the Australian Cattle Dog with horses, its best to do it gradually but early. Expose him to the sights and sounds of horses in the farm when they are young. This will remove the possibility of being fearful of the bigger sized horses in future. Like many other dogs, the Australian Cattle dog is susceptible to certain health issues such as hip dysplasia, progressive retinal atrophy and deafness. But much of these health conditions is hereditary and if you can provide a healthy environment with plenty of activities, things should be alright. This loveable and affable dog originated from Wales. There are two breeds of Corgi, the Pembroke Welsh Corgi and the Cardigan Welsh Corgi. 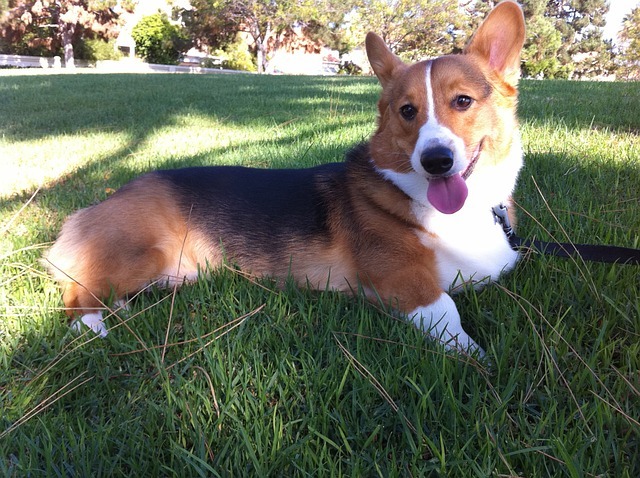 Of the two, the Pembroke Welsh corgi is more common. Corgis are the smallest breeds amongst this list but that is by means saying they are less effective. They use their smaller height to their advantage. They stand at between 10 to 12 inches. The lower height aids in avoiding getting kicked by livestock while herding. They herd by nipping the heels of livestock. Due to the hardiness of Corgi, they do well when placed alongside horses. Very often, you will see Corgis taking part in agility competitions and obedience trials. And this is because of their in built qualities. Their health issues are canine hip dysplasia, canine degenerative myelopathy and progressive retinal atrophy. However, they are actually hardier than what statistics suggest. Typical life span of a Cardigan Welsh Corgi is 12 to 14 years while Pembroke Welsh Corgis have life expectancy of 12 to 15 years. Corgis are able to survive in different environments. Whether the temperature is low or high, they thrive and excel if given proper training. Naturally playful, it is important for the dog owner to keep their playfulness in check to avoid agitating horses at the wrong time. Who can forget the all time favourite of dog owners? The Golden Retriever. Well known to be the friendliest of all dogs, the golden retriever is highly intelligent and will be a cordial companion to your horses. They are known to have such gentle jaws that they can carry eggs in their mouths. Because of their mild temperament, they will not create unnecessary panicky moments for your horses. Their calm nature complements horses well. They do well in both hot and cold climates. Though, it is preferable to keep their coat shorter during hotter seasons. Their size ranges between 21.5 inches to 24 inches tall and weight between 55 to 65 pounds. They are strongly built and agile. Common health issues like hip dysplasia, elbow dysplasia and cataracts are common in older age golden retrievers. 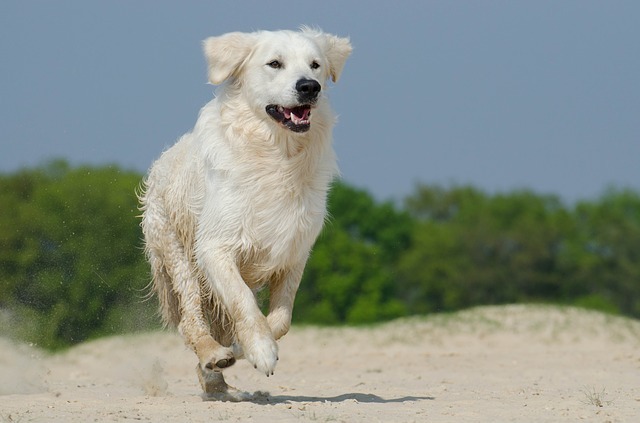 Golden retrievers need daily exercises to keep them fit and healthy. That is why they are a perfect match for horse owners. Let them mingle with the horses for 20-30 minutes a day to work them out will help to starve off some of the chewing destruction they can inflict indoors. And when your Golden is growing up, its good to let them run in the fields instead of the hard floor to prevent bone issues. Socialise them with horses early to ensure they develop familiarity with horses. These 5 breeds of dogs have proven over time to be fantastic companions of horses. Horses have good memory and once that relationship between your dog and them is established, it can spawn a wonderful relationship that lasts for years. Do remember that simply putting any of the above five breeds with your horse does not make them natural friends. It takes time and effort to cultivate and train a dog to be a great friend of your equine pet.
. but when did it become guitly before proven innocent? i totally agree, the dogs didn’t mean to do what they did, they did it to get love they thought that if they did this maybe they can get some love (i’m talking about the dog fight dogs.) when did it ever, EVER! become okay to kill a dog because it was a pit bull? you know a long time ago the pit bull was thought of to be the best dog any one could have? but then some day after a person decided that the pit bull wasn’t a good dog that the dog was horrible! and ever since the breed has been put on the death list? if pit bulls never existed, you know we’d all be saying that a dog like the rottwelier was horrible and needed to be put down like some are saying about pit bulls for once people GIVE THE PIT BULLS A CHANCE AT LOVE AND TO PROVE THAT THEY CAN LIVE A LIFE LIKE THE GOLDEN RETIVER OR THE YELLOW LAB HAS! The difference between pit bulls and labs is that it is more likely for a Pitt to attack than a lab. Lions whether bred in captivity or not, are not made to be pets. They are dangerous due to their bred mentality, sometimes you can train them but there are always times where things go wrong. Pitts in a way fall into the same category as lions. They were bred to be a certain way and it stuck, you have to be absolutely perfect when it comes to training Pitbulls because they can be so dangerous, their jaws lock onto you and they don’t let go. That is the bite they were bred to have, they had been bred as fighters and it will take a lot of time to rebuild genetics and give new instincts. I’m sure there are really amazing pitbulls out there, but the majority of violent ones are still at a pretty high statistic. People love their dogs, but sometimes we need to understand that each dog could potentially be dangerous. Each one relates back to wolves, keep that in mind. I’m a world class hunter jumper with 5 horses. I think I’m going to get a dalmatian. No need to brag Alana akalani@gmail.com.